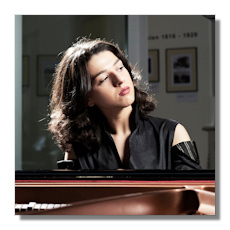 While most pianists would conclude their recital with the Sonata from Franz Liszt, Khatia Buniatishvili, at the Cité de la Musique in Paris, choose to open with it. She is a fearless performer. Focused and intense – this mysterious sotto voce opening seems even more daunting when it has to form the first sound to resonate in the hall – she is sure to grab your attention from the very first bars and never really let go. You may first notice the speed, the vehemence, the electrifying energy, the occasional risk-taking, too, but pretty soon she also wins you over with her thorough control of sound and color (in spite of a none too flattering instrument provided by the Cité de la Musique), her unerring ability to really nail the key notes during the hardest passages, her dramatic presentation and the utterly romantic sweep that kicks Liszt back to life. In any case, Khatia Buniatishvili doesn't take any prisoners, but I guess most in the audience would have been willing to give their lives. She possesses the freedom to shape this music at will, yet the good news is she has a clear idea of how to use that freedom and while she may occasionally throw in a few flashes to reinforce the message, musicality prevails over empty rhetoric and circus display. Promises are kept, Buniatishvili makes you believe in anything she does. Liszt's multiple themes are unraveled with the sang-froid of a bullfighter and there is never any doubt about her structural grasp of the work. She doesn't offer an easy ride (not that we want one), but it is an exhilarating one. From the start, her rubato in the Allegro energico was pulling towards the Grandioso passage, which sounded more inevitable than ever. The slower sections had a mesmerizing, almost improvisational quality. She tends to linger, perhaps too much at times, but what heartfelt tenderness, what grace she finds in these pages. In the Quasi adagio her gentle ruminations gradually revealed the underlying tension, which after a few bars felt as if it could erupt any moment. And erupt it did. But when she effortlessly whipped Liszt's Allegro energico (what a superbly played fuga) and Prestissimo fuocoso markings into submission, we were convinced it wasn't for the calculated effect of "see-how-quick-I-can-play", but simply because the music demands it. This was playing of absolute mastery, and of total seduction. The effect was magnified in the 1st Mephisto Waltz, which got a blistering performance as well, carried by an infernal rhythmic drive that grabbed the demonic Liszt in uncompromising terms and smelled of sulfur from beginning to end. The beauty and nostalgia Buniatishvili found in the middle section were totally out of this world. Next came the Scherzi #1 to 3 from Frédéric Chopin. And while it's not particularly interesting to hear three of these Scherzi back to back, their volatile character suited Buniatishvili like a glove and she intensified the contrast between the agitated outer sections and the slow central passages with plenty of imagination. This Chopin was feverish, impetuous and bold, but one who also showed his other side in hyper-delicate confessions. Yet the true strength of Buniatishvili's readings resides in her ability to make these Scherzi sound as improvised, as if fired up by the mood of the moment, best demonstrated in her pensive, sincere treatment of the trio's. Buniatishvili concluded her recital with a take-home performance of Igor Stravinsky's Three Movements of Petrushka. She not only captured the characters and scenes of the ballet with striking accuracy and detail – I had no problem seeing the ballet in front of me – she also honored Stravinsky's attempt to bring out the harmonic and percussive possibilities of the instrument. In spite of the devilishly fast tempo, the different voices remained intelligible in even the most note-saturated passages. The transition between the opening Russian dance and the scene in Petrushka's cell was handled with tremendous theatrical flair. The hustle and bustle of the market scene was painted with vivacity, dramatic eloquence, a touch of playfulness and sarcasm. Seeing the blur of her hands covering the full keyboard only enhanced the excitement. Again, this was piano playing of the highest order. Only 24, but what charisma and what generosity. You may disagree with certain positions she takes, but there is no denying that behind her dizzying technical gifts, here is a young artist whose musical insights are totally refreshing and demand to be considered. Before the recital people were abuzz with comments full of anticipation. While many had heard about the young Georgian pianist with the difficult name (there was even some confusion with her compatriot, violinist Lisa Batiashvili), it was obvious not many had actually experienced her live yet. When the recital was over, however, there couldn't have been any more doubts: a new lioness of the piano has entered the arena and her name is Khatia Buniatishvili.